To change your name (first and/or last) in the Campus Directory, you have two options. 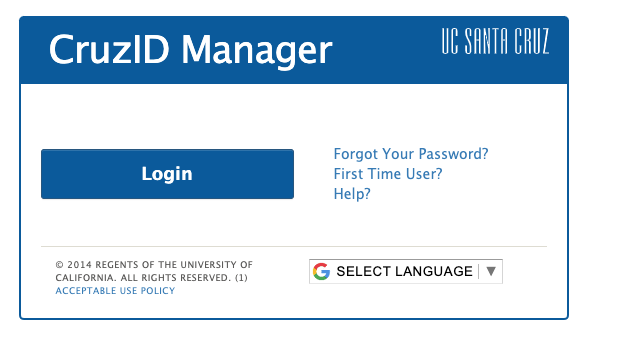 A) Change your official name; go through the Registrar's Office and fill out a Request for Change of Name form at http://registrar.ucsc.edu/forms/students/name-change.pdf. B) Add or change a preferred name; see the FAQs at https://registrar.ucsc.edu/faqs/students/personal-info.html for information about what a preferred name is, how it is used, and how to specify one. Once your name change is processed, your new name will be updated in the Campus Directory within a day. To change or remove your student phone number from the Campus Directory, follow the instructions at http://registrar.ucsc.edu/faqs/students/update-phone.pdf. The Campus Directory only displays the "Local Land Line" phone type. To remove this phone number from the Campus Directory, delete your "Local Land Line" phone number. You can add the same number with a different type (e.g., Cell, Permanent) and it will stop appearing in the Campus Directory by the next day. Search for yourself, click on your name, and then click on the Edit this entry link at the bottom of your profile page. If you are unable to update your information online, contact the ITS Support Center for assistance. 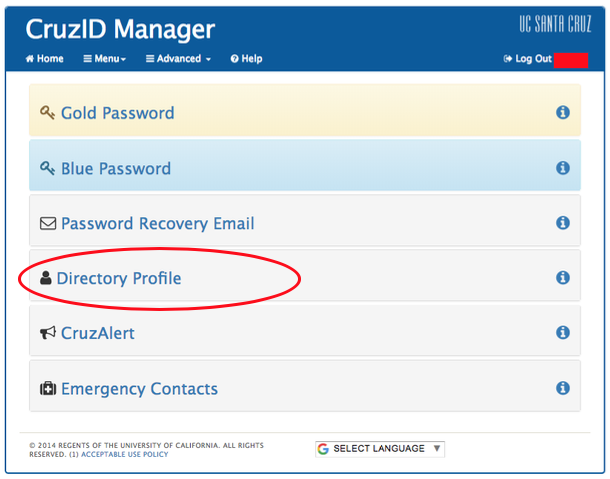 In order to update your directory information online, you will need to log in to the CruzID Manager with your CruzID and Gold password. If you need assistance, please contact the ITS Support Center. Fields with additional information or instructions have an ‘i’ button next to the field, which can be selected to display the additional text. Fields which can have multiple values will have plus and minus buttons which can be used to add and remove rows, and drag icons which can be used to rearrange the order of the values. Each time you update a field and hit return on your keyboard or move to the next field, your changes are automatically saved. You can also click the blue Save button at the bottom of the profile page. Your changes will be published immediately in the Campus Directory. Click the “View Public Profile” link to view your changes in the Campus Directory. Upload a photo to your profile page by clicking on the green arrow button. Photos must be a JPEG file and may not exceed 2 megabytes. To display properly, upload a square image. To change or remove a photo, click on the red X button. All required fields must be entered before a photo can be uploaded. Enter your campus/office street address. Do not enter your personal home address in this section. Faculty have the option to add advisees, grad students, and researchers, in addition to courses taught. Type an advisee’s CruzID or name into the field, and select from the search results. Use the plus and minus buttons to add and remove up to ten advisees and courses. 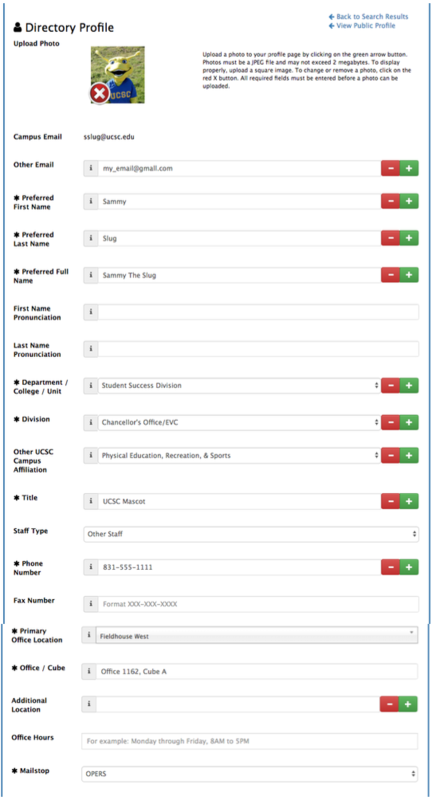 Rearranging the order of advisees on this page controls the order in which they are displayed in the Campus Directory. Faculty, staff, and students have the option to add a biography, summary of expertise (not for undergraduate students), research, teaching interests, and awards, honors, and grants. Click on each tab to move to the next section and to save the information entered. Faculty, staff, and students have the option to add web sites, exhibitions, performances, publications, and recordings. Use the plus and minus buttons to add and remove up to five web sites. 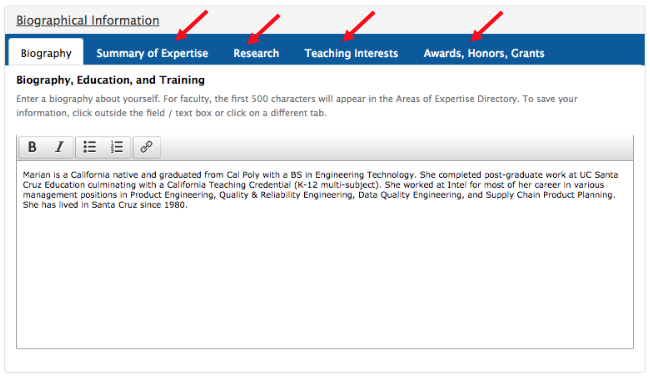 Faculty have the option to add areas of expertise and press contact information. Use the dropdown menu to select an area of expertise, and the plus and minus buttons to add and remove up to ten areas of expertise.